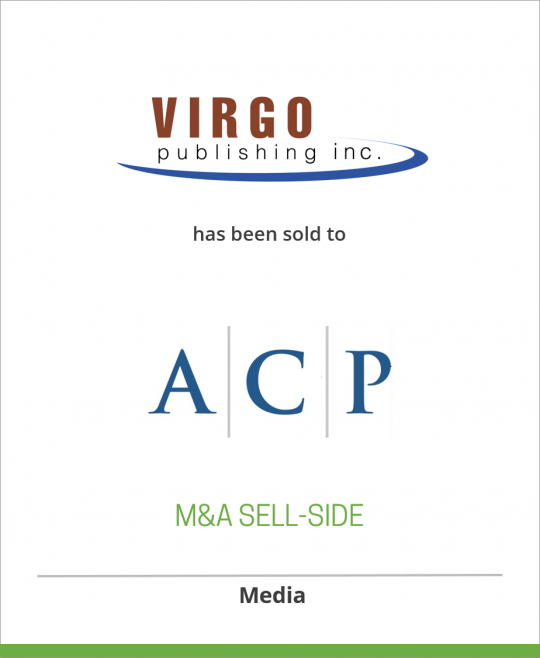 Virgo Publishing, an integrated B2B publishing, events and e-media company with 17 magazines, 10 shows/ conferences, training and accreditation programs and a growing online platform, has been sold to Arlington Capital. Virgo Publishing founded in 1986 and based in Phoenix, Virgo publishes seventeen national trade magazines and produces ten trade shows and conferences across several industry groups including natural products and healthcare, telecommunications and business solutions. Virgo is the producer of SupplySide and has been successful in leveraging its events, publications and electronic media to provide integrated solutions to the markets it serves and will continue to focus on expansion through key strategic acquisitions. Arlington Capital Partners is a middle market private equity firm focused on buyouts and recapitalizations in targeted growth industries in partnership with management. The firm leverages a combination of private equity and operating experience, as well as an extensive network of strategic contacts, enabling Arlington to be a value-added partner and investor.